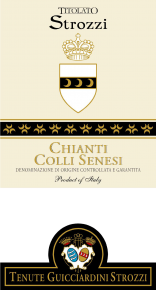 Chianti Colli Senesi is produced in the hills around Siena. Sangiovese grapes, all from estate owned- vineyards around the property of Villa Cusona, are enriched by a small selection of other red grape varieties. The color is deep ruby red, with bright highlights. It is fruity and floral on the nose with youthful fragrance.Fresh yet full, with fine, elegant tannins and a long, pleasant aftertaste. Its characteristic freshness makes it the ideal wine for a meal of pasta with red tomato sauce, meat and cheeses. “Titolato’ stands for ‘having a noble title’. The family logo bears two crowns, the one on the left represents the Guicciaridni Counts, the one on the right is for Prince Strozzi. Vinification takes place in concrete tanks with maceration on the skins. No oak ageing. To preserve the fragrance of aromas the wine ages in the bottle for several months.